Here are three ways to make an adorable and functional pin cushion out of items and fabrics you already have! Pin cushions can also act as decorative pieces in your sewing studio and make fabulous gifts for all your sewing friends. 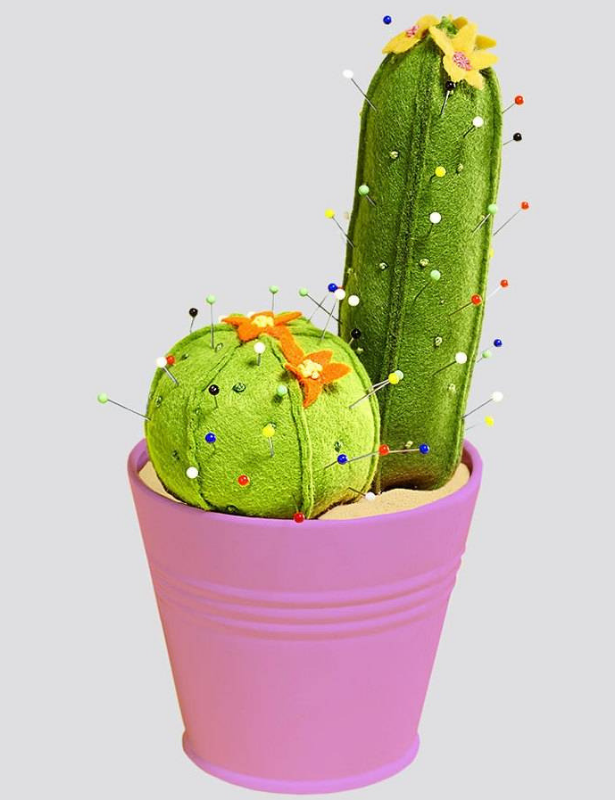 This colorful cactus pin cushion is just the right gift for sewing enthusiasts! And is ideal for using up felt remnants. Download the pattern here! Round cactus: Cut the small section 6x from green felt. Note: Add 0.5 cm seam allowance at the edge. Put pieces right sides together and sew at 0.5 cm, so that the seam allowance is outside. Then cut back to 0.3cm. When sewing: Leave a small hole on one side – by stuffing the cactus with filling cotton, sew the hole by hand. Cut the flower template 2x from colored felt (or fabric) and sew it to the cactus using embroidery thread and knot stitch. The big cactus is made in the same way as the little one, except that 4 cut pieces are sufficient and 3 flowers are sewn on it. The flowers in the look vibrant and hold all needles together all year long without watering. With fabric scraps, filling wool and felt, they are quickly self-made. The pincushion lower right consists of 12 leaves 3.5 × 6 cm. After cutting, round off the fabric rectangle at one end. Now stitch each 2 pieces pieces together around the long side edges and the curve (seam width 5 mm) leaving the bottom ends open. Now you can turn the “pockets” right side out and stuff them with stuffing. The flower center consists of a round piece of felt (diameter 4cm). Pin together the open edges of the leaves and stitch them side by side on the outside edge of the felt circle. The leaves should be outside. At the end, cover another button with the diameter of 4cm with a piece of fabric and sew it on the felt circle. 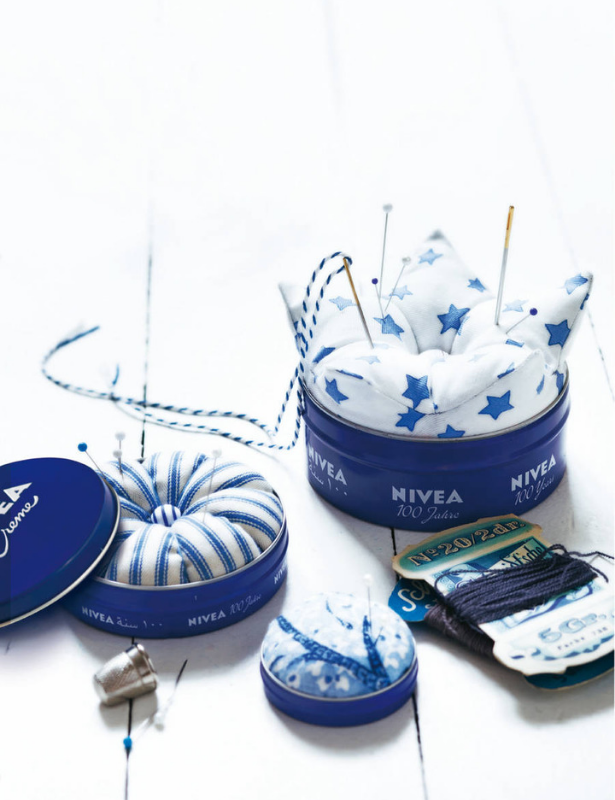 Sweet pincushions are created from empty hand cream cans! 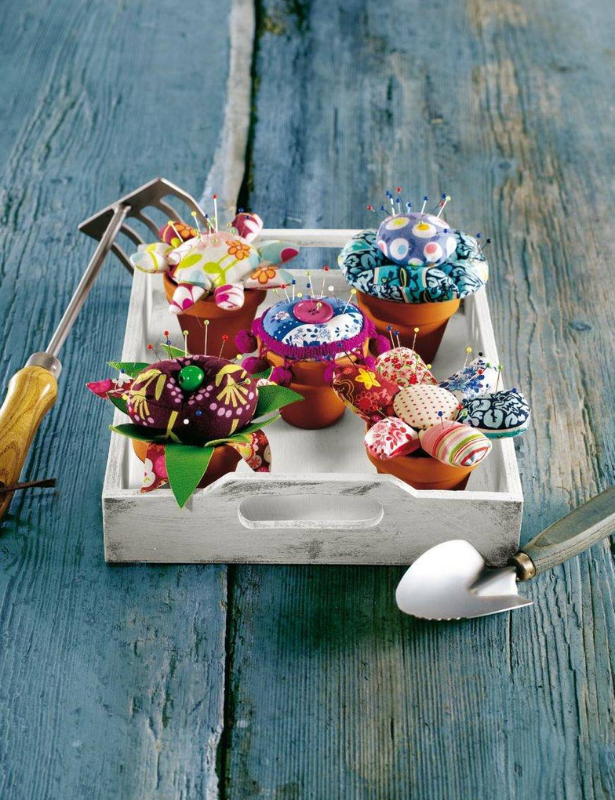 The future of empty cream pots can be so fulfilling: as delightful pincushions in different sizes. Download the pattern here! Small pin cushion: Cut 2 circles, Ø 7.5 cm, from the fabric. Stitch circles right sides together (seam width 5 mm), leaving approx. 4 cm open for turning. Turn. Gently stuff pillow with stuffing, sew seam opening. Put the pillow in the small can. Medium pincushion: Cut 2 circles, Ø 10.5 cm, from the fabric. Stitch circles right sides together(seam width 5 mm), leaving approx. 4 cm open for turning. Turn. Gently stuff pillow with stuffing, sew seam opening. From the middle, embroider the cushion with thick thread so that 8 “pieces of cake” are formed, and tighten the embroidery thread uniformly. Cover and sew on the button in the middle of the cushion and place in the can. Large pillow: Cut out pieces A and B (downloaded here): Part A (lateral part) 1x on the fold, part B (upper part) 5x all around with 5 mm wide seam allowances. In addition to the pieces, cut a circle Ø 11 cm. Stitch together all part B pieces to create a circle, always starting or ending 5 mm before the edges. Press seam allowances open. On piece A, stitch the short side seam right sides together and press open the seam allowance. To create the spikes, stitch the sewn B pieces to piece A along the jagged edges right sides together. Partially clip into the V’s between the points. Stitch sewn pieces A & B to the bottom circle right sides together leaving a small opening. Turn to the right side and stuff with filling. Tip: Use a point turned to get those points nice and pointy! Stitching the opening together by hand and sew on the button by hand in the middle of the cushion. Place in large tin. Which pin cushion style are you more likely to make? Beautiful stuff! There’s things here I’d love to get for my house. I’m working from home on this website , so designing is very important for me as I’m spending 18-20 hours a day at my house. Thank you for these incredible tips. Definetely going to use them!